This site describes my experience in designing and installing a residential grid-tie PV system at my house (ele. 650ft) on the Kona side of the Big Island. Hopefully this site will help others down the same path. I was inspired to write this because at the current date (December 2006) there is a lot of information available on installing solar water heating, but almost nothing with sufficient detail to enable actually designing and installing a grid-tie PV system. PV is short for Photo Voltaic and is a technology for generating electricity from sunlight. 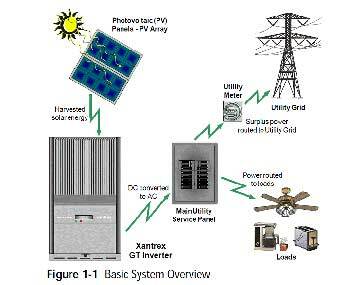 Grid-tie, just means that the PV panels are connected to the electricity grid (using an inverter); this is sometimes also called distributed generation. Net Metering is a billing plan; when the sun shines the PV panels generate electricity, the inverter turns DC (from the PV panels) to AC and the electricity meter runs backwards, during the remainder of the day the electricity meter runs forwards. The user pays for the Net change in the meter, plus a HELCO connection charge. The carbon footprint of my house is approximately similar to that of my car. So a residential PV system is way more effective a reducing C02 emissions than a hybrid car, ethanol in gasoline, and possibly than bio-diesel. So add solar panels first. The Net value of the electricity registered by the meter is averaged over the year, so the sunny and cloudy months average out. Too big a PV system and over a year I generate more electricity than I use, and I do not get paid for the extra. However the extra generated electricity is not wasted but added to the grid and somebody uses it—I just don't get financial compensation. HELCO is in effect buying electricity from me at the retail rate (up to a limit, my usage) – that is a deal. It is possible to wholesale electricity to HELCO but that is outside the scope of this document. This is not a backup or off-grid electricity generation system. When HELCO has a power interruption, so will my house; even if it is a bright sunny day. The solution to this would be to add batteries like an off grid PV system; this adds a whole level of complexity that I chose not to look at. HELCO must be able to disconnect the system in the event they are working on power lines in my area. So the system must include an easily accessible ‘AC Disconnect Switch’ located between the inverter and the breaker box. I already have solar water heating; directly heating water with the sun is more efficient than having PV panel generate electricity which is then used heat the water electrically. The economic return for water heating is better using the more direct method. PV Panels are connected in “strings”, a string is a set of panels connected in series. Multiple strings may be connected in parallel; each string must have the same number and type of panels. Inverters set minimum and maximum numbers of panels on a string. Inverters usually allow a maximum of 2 to 4 strings. Strings refer to the electrical connection between panels and not the physical layout; a string of six panels may be physically laid out on the roof as two rows three, three rows of two, one row of six, or I suppose in a circle with the surroundings painted to look like a flower.